I am firmly part of Camp #1, though when I discussed alignment before, I wasn’t ready to go so far as to predict that the old 9 alignment system would be making a comeback. One of the reasons I am firmly in Camp #1 on this is because, in matters of 5E, I find myself trending towards nostalgia and a return to “the way things used to be.” But I’m also in Camp #1 because, as the 5E designers have said numerous times, 5E is supposed to be about the essence of D&D. And alignment is not only quintessentially D&D; it’s also part of the collective cultural zeitgeist. 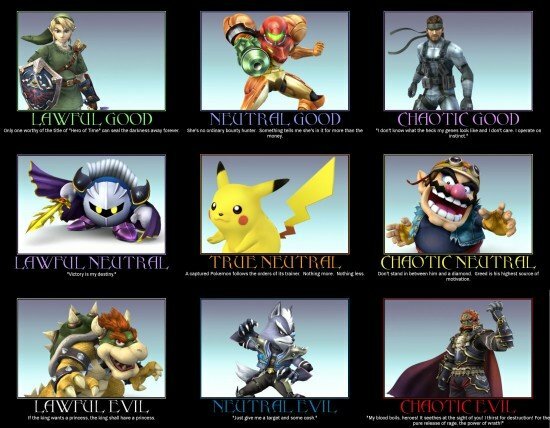 This is just the most recent example of the Internet “alignment chart” meme. 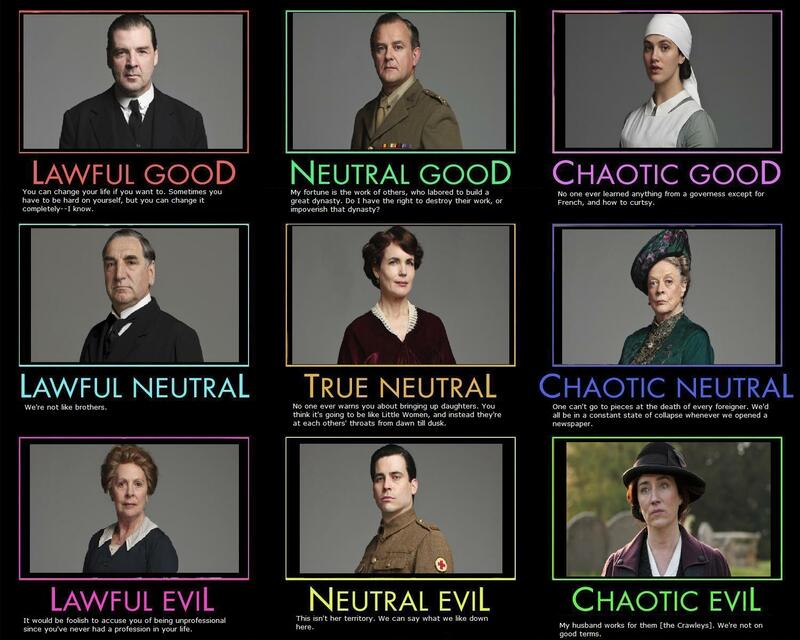 You can find charts like this for every movie, TV show, and game, from Nintendo characters to Downton Abbey. Here’s the thing: people get this. Even people who don’t play D&D, like my wife, get these things, find them funny, share them on Facebook and Twitter. And they know where the alignment system comes from: D&D. The old-school 9 alignment system is so classically D&D that it needs to be in 5E. Not as some optional module in some supplement down the road, but as a core option in the core rulebooks. Maybe it won’t be the only one. But if it’s not there at all, it will be a crime of cultural proportions. I use the 9 type of alignment in my 4e games. The issue with alignment basically gets down to the “grey” areas and that there mechanics behind it. On paper it’s fine, but once you have two people at a table who have a difference of opinion (based on their real life morals and religious values) on what is good and evil, it starts to go downhill. Sure, most people can agree that stomping puppies is not exactly a good act, but if you bring the BBEG back alive is letting him be executed “good”? It might be lawful, but is that a good act or should he be forced to serve time in prison. Is it evil for the Paladin to kill the Troll that is actually a human polymorphed? If there is a wagon carrying children about to plunge into a river, and a dragon overhead attacking a town – which is the correct one to face first? If a dragon is burning down the forest, is it ok to kill the dragon when all the dragon is trying to do is keep the pyre for his mate burning after the townsfolk killed his mate and his brood, what if they never did anything to the townsfolk before? The issue is that people start applying their own morals to the game at that point – it’s not something the rules ever did a good job of adjudicating, and there were plenty of DMs who basically used alignment as a trap to their players. So I am fine with the return of the alignment system from AD&D (basic actually just had Law, Chaos, Neutral), but there should not be mechanics that the DM uses to punish the players associated with it. Bring back the books and magic items that go “boom” when someone of the wrong alignement uses it, bring back the “detect evil” spells – but don’t start inflicting xp penalties or removing class features.